I hope you all had a wonderful holiday and are enjoying the beautiful summer weather (finally!)! 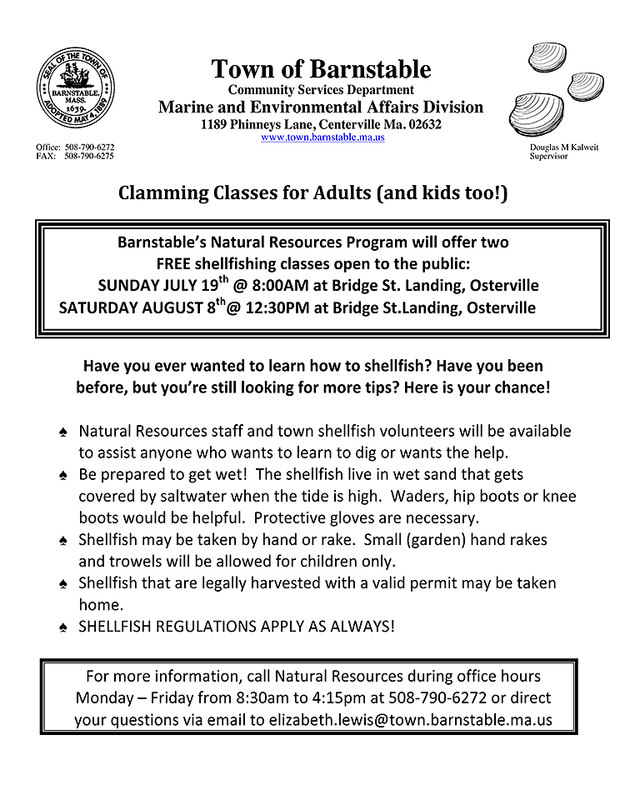 We have had so many requests here at Natural Resources for a clamming class for adults that we have decided to give it a whirl. 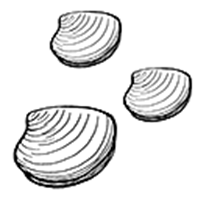 As some of you may have noticed at the landings or on our website, we are holding our first adult clamming class on Sunday July 19th at 8AM at Bridge Street Landing. I have attached the flyer. Adults and kids are both welcome and the more the merrier. It has been exciting seeing so many new faces and getting more folks involved in the fishery. I think this is a really good opportunityfor everyone involved. I am asking for your help! I will not have as much staff as usual for this event so I am hoping I will have a nice showing of volunteers to help me teach! Our primary focus will be on quahogging, but I know a few people are coming to learn how to dig softshells. There are still some holes around Bridge Street and along the shoreline to the East of the landing and I would love to use this opportunity to show people how to dig softshells (including backfilling holes, breaking as few as possible, and replanting the seed). Anyone that is able to volunteer, if you could show up 20 minutes before the class starts (7:40), that would be wonderful so we can get ourselves organized. Many people often show up early for the class. I’m really not sure how many people will be attending the class, but I would like to be prepared regardless. And thank you all for helping to make the kids clamming class a success! There will not be as many digging projects as usual this year, but do not fear, we have LOTS of quahogs in the flupsy and they are growing right on schedule. I anticipate the first plant coming around the end of July and several more taking place throughout August and September. I may have some digs prior to these events to make sure an area is cleaned out because some of the sites will be old propagation areas and we may find lots of quahogs already in place that will need to be relocated. I will let you know of these dates as soon as I can. We have been bombarded with a lot of things at once this year so I appreciate all of your patience! Please pass this email along to those without email and to anyone else that may be interested. If all else fails, we will just have a big clam digging party! Let me know if you plan on attending for peace of mind. Thank you all! ← BARS wants your bottles and cans!